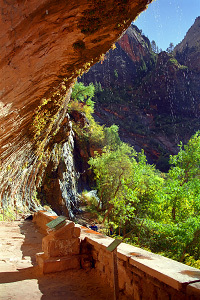 Weeping Rock is a famous landmark of Zion National Park and is an easily accessible tourist attraction. Weeping Rock is a large bowl-shaped alcove where the lower layer of sandstone has eroded away; water that has been slowly descending within the sandstone formations reaches an impermeable layer of rock and is forced out the side causing the "weeping." The weeping walls form a beautifully lush hanging garden with a little flowing stream below. While there are many weeping walls in Zion, this is the featured one with a paved trail and platformed viewing area constructed under the alcove back in the early days of the park. The stroll to Weeping Rock is a short 10-minute family-friendly stroll. From the Weeping Rock Trailhead, the 7th stop on the Zion Canyon Shuttle, walk up the parking lot, cross the little hiker's bridge, then turn left to hike up the paved trail to the viewing area. Soon enough you will be standing under the beautiful alcove with the wonderful water sprinkling from above; this is a perfect little spot for both yound and old. Please note that while the trail is paved, it is not exactly wheelchair accessible because the trail is fairly steep and there are several steps near the end. 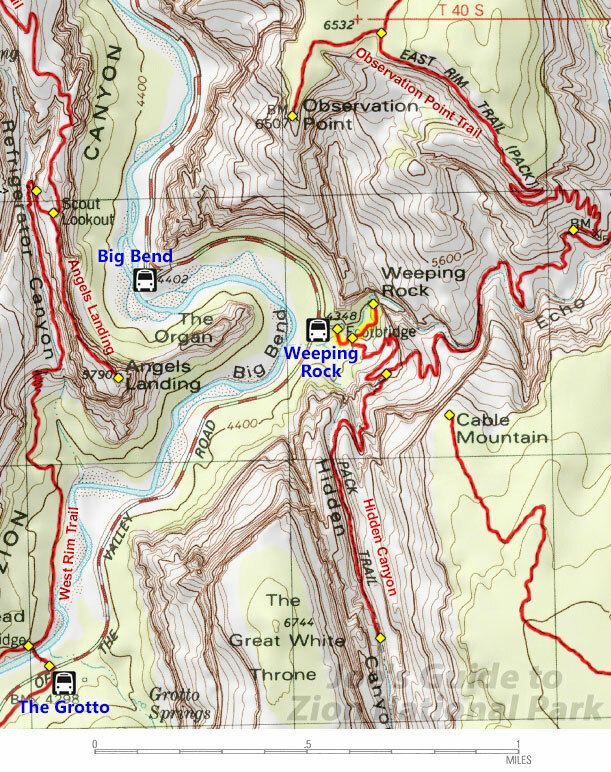 For those looking to do more serious hiking, The Weeping Rock Trailhead is also the starting point for the famous Observation Point Trail, Hidden Canyon, and the East Rim Trail to Cable Mountain, Deertrap Mountain, and the East Entrance Trailhead. Steps by the hikers bridge also provide access to the Weeping Rock stream below and during the hot summer months, this is very popular with children. Primative restrooms are available in the Weeping Rock Trailhead parking lot. During rainstorms, a large waterfall often forms at Weeping Rock from all of the channeled water coming down Echo Canyon from above.